Tom Mahady (right) often fills in as an acolyte when needed. Photo: Matthew Lau. 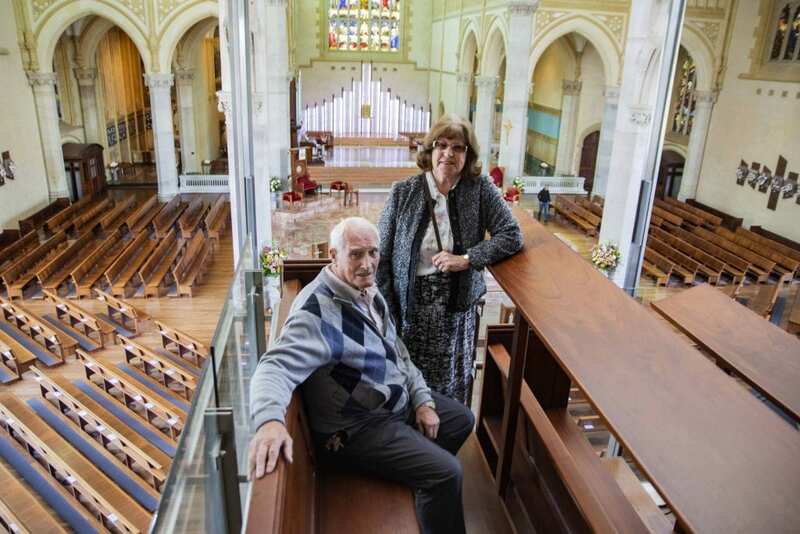 Daily morning Mass at their ‘second home’ remains a priority for Tom and Angela Mahady, five years after stepping down from their long-standing sacristan duties at St Mary’s Cathedral. From 1994 to 2014, the Mahadys were the first lay sacristans at St Mary’s after the Sisters of Mercy were relieved of the duty. The Irish couple arrived in Sydney from Dublin in 1969, before moving to Perth in 1981. In total, they had six children, 23 grandchildren and 20 great grandchildren. 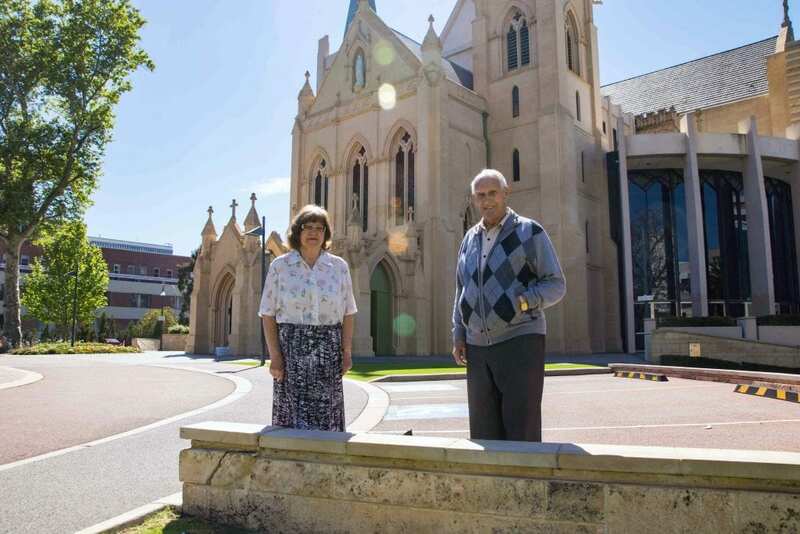 The Kewdale residents have always considered St Mary’s Cathedral as their home parish. 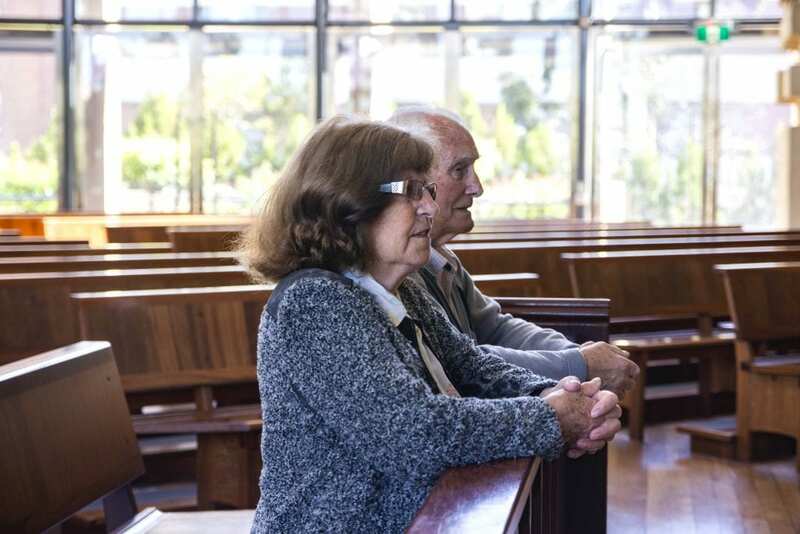 “It’s similar to the big churches back home [in Ireland],” Tom, 83, cited. The Mahadys married at Precious Blood Church in Cabra West, Ireland, in 1958. Photo: Matthew Lau. Then-Cathedral Dean Monsignor Patrick O’Reilly asked Tom and their son to be acolytes at the Cathedral during Archbishop William Foley’s leadership. Tom recalls the now-Saint Pope John Paul II’s visit to Perth in 1986. “I served as acolyte up in the racecourse with all the other acolytes. During this time, Tom worked in various industries, including the building and motor industries. He did not have a particular trade, but put his hand up when the Cathedral required handiwork. “I had the key; we used to open up in the mornings and close up in the evenings. We weren’t just involved with the sacristy; we were involved with everything really. “It was a big job but I did it for the love of God – we just made it part of our lives,” he added. “We’ve always had a simple faith. We do it for the love of God. “Some people probably think differently. They wonder why I spend so much time in the Church,” Tom continued. Tom and Angela Mahady were sacristans at St Mary’s Cathedral for some 20 years. Photo: Matthew Lau. Angela, 82, said they organised everything for the priests and bishops during their two decades of volunteering. “We loved every minute of it. We did our best with everything that had to be perfect,” she expressed. “We would come here seven days a week, we put the family aside and we just did our work to the best of our ability. “Back in Ireland, we used to go from one church to the other during the day. Different Mass, different times,” Angela added. In a 2014 interview with The Record, Monsignor Thomas McDonald described the decision to give the Mahadys the role of sacristans as “the best thing I ever did” as Cathedral Dean.